The most recently described genus of New World Monotomidae, Crowsonius, comprises only three species and is currently incertae sedis within the family. Numerous highly specialized morphological adaptations prevent easy assignment to a tribe or subfamily. It is unclear which genus is the closest relative within the family. The type species is Crowsonius meliponae (Pakaluk & Ślipiński 1993). Crowsonius can be distinguished by the following features: procoxae rounded with hidden trochantins, antennal club weak and one-segmented, eyes with single facet, elytra distinctly costate, and hind wings absent. Crowsonius is a nest-inquiline of Trigona bees (Hymenoptera: Apidae). 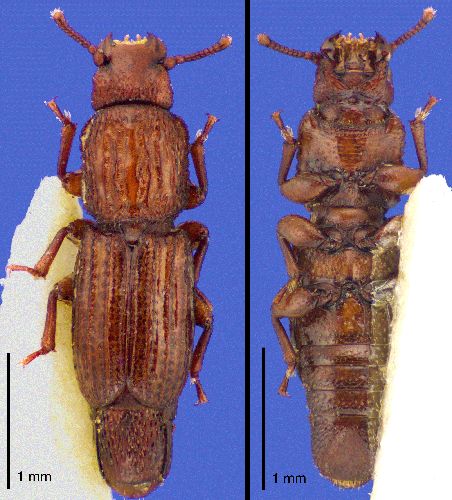 Gut dissections suggest that these beetles feed on refuse piles within bee nests. Because they are wingless and nearly blind, it has been hypothesized that Crowsonius disperses via phoresy upon its host (Pakaluk & Ślipiński 1993). Mellitophily is rare in Coleoptera, making the biology of this genus unusual. Crowsonius species have been collected rarely and only from their host's nests. Currently, this genus is known from only three localities in Costa Rica and Brazil (Pakaluk & Ślipiński 1993, 1995). It is possible that Crowsonius is represented everywhere that the host bees occur, but their currently available distributional data are extremely incomplete due to the rarity of collections.